This is a bit of an experiment for us here at e23. When we first started thinking about going into the online sales business, we weren't sure we wanted to sell our old out-of-print titles at all. Barring doing a lot of expensive and time-consuming reconstruction work, we were looking at just straight page scans, which are a) memory hogs (the GURPS China PDF is 60MB); b) only so-so looking; and c) not searchable. Yet, lots of other companies post straight scans of their old out-of-print books - mostly dating from before the era of desktop electronic publishing - and sell them without complaint. This is where you, the faithful e23 customer, weigh in. We have an e23 board on our public web forum, and you are invited to post there about how you feel about scanned in out of print titles. Or you can email us direct and tell us what you think that way. 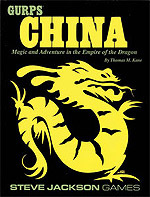 Should we bring you more books the same way we've done GURPS China, and do it now? Should we make them better looking, easier to download, searchable - and possibly more expensive - and take our time to do it right? Or should we not bother doing them at all? We look forward to hearing from you.